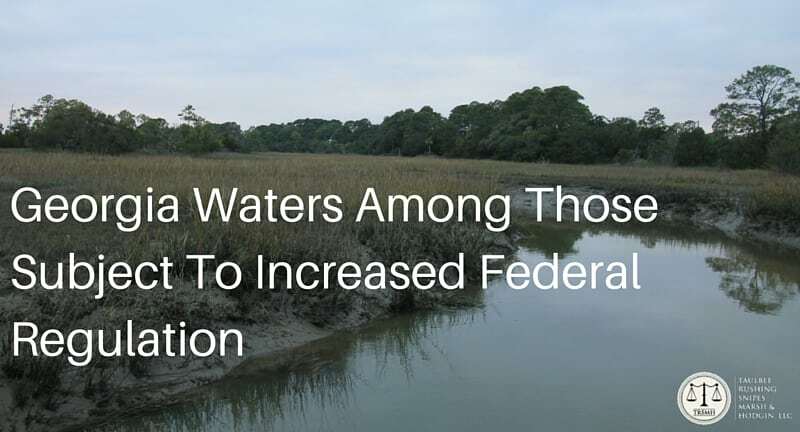 The Clean Water Act authorizes the Environmental Protection Agency (EPA) and Army Corps of Engineers (ACOE) to limit pollution in “navigable” waterways. On June 29th, the EPA published its Clean Water Rule, which expands the definition of navigable waterways to include the tributaries that feed into those waterways. Twenty-seven States, including Georgia, immediately filed suit to enjoin enforcement of the new Rule claiming that it infringes on States’ rights. United States District Courts in Georgia and West Virginia agreed with the EPA that legal challenges to the Rule could only be brought in the United States Court of Appeals for the 6th Circuit and therefore denied the requests for preliminary injunction. On August 27, the District Court for North Dakota found that it had jurisdiction and granted the request of a number of States and issued a decision preliminarily enjoining the Clean Water Rule. The new Rule went into effect in all other States, including Georgia, on August 28th. If you live in Georgia or one of 36 other States, the EPA and ACOE may assert jurisdiction over certain bodies of water that were previously excluded from their jurisdiction. According to the suit filed on behalf of the State of Georgia, these could include areas as small as roadside ditches. However, if you live in Alaska, Arizona, Arkansas, Colorado, Idaho, Missouri, Montana, Nebraska, Nevada, New Mexico, North Dakota, South Dakota or Wyoming, the government will continue to enforce the preexisting Rule with its more exclusive definitions. Obviously, this creates disharmony under the federal Rule and assures that we will see more litigation regarding the limits of the government’s jurisdiction. In the interim, it will be important to exercise caution and consult an attorney before undertaking any projects in your wetlands, streams and other areas that might now be subject to EPA and ACOE jurisdiction. If you have questions about how this affects you, please contact our firm. Chris Gohagan is an associate at Taulbee, Rushing, Snipes, Marsh and Hodgin, LLC. A graduate of Clemson University and the University of South Carolina School of Law, Chris is a litigator whose experience covers an expansive number of legal areas.